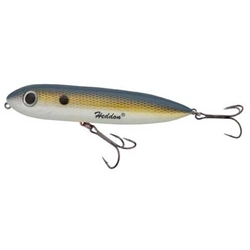 The Heddon Rattlin' Spook includes a rattle chamber which holds tungsten BB's that will amplify the sounds of panicked and fleeing baitfish. This sound chamber makes it easier to produce smooth walk-the-dog retrieves. These come with #2 hooks, length of 4-1/2", and 3/4oz which will help to seal the deal when big bass crash the surface.